We have developed two series of printing machines, with different levels of automation, able to satisfy each production need. The G Series, with centring out of the printing table and the J Series for big formats, with centring directly on the printing table. Both can be connected in line with dryers for curing of the ink, using UV or IR technology, optionally chiller units for low glass exit temperature are available. 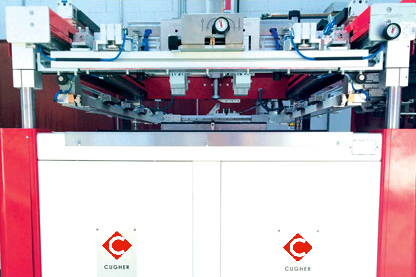 The Cugher silk screen printing machines are able to print on symmetrical, asymmetrical, single, double and paired glasses, with standard dimensions up to 2500×4000 mm and thickness varying from 1,4 up to 10 mm. • Print Repeatability Precision of +/- 0,08 mm. Our system allows a perfect control of the height of the printing bridge, having a height position precision higher than 0,1 mm. The vertical movements of the printing bridge are controlled as a digital caliber, which has the “zero” represented by the printing table (perfectly flat, even surface) and the operator can set the desired height into the touch panel. 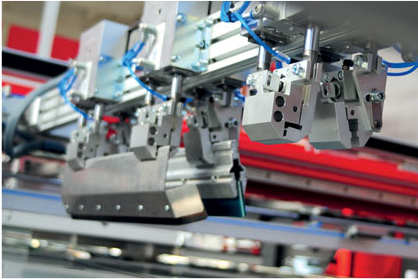 Pull out of screen with pneumatic Screen Frame Locking System. The screen can be locked in position by means of pneumatic cylinders and it’s possible to use frames of different heights. Thanks to this feature, the operator doesn’t need to lock manually the frame, and the insertion and extraction of the screen results to be an extremely fast and easy operation. All settings are controlled from the operator side. Printing bridge with digital proportional valves. 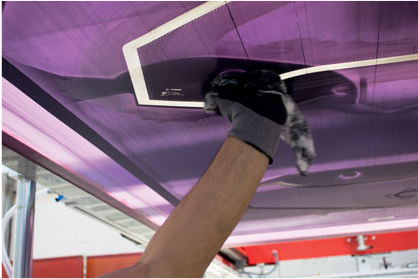 Thanks to pneumatic calipers the squeegee and flood bar can be easily inserted/replaced. Anti-drip System: no more issue with light colours.